My grandma used to say this every morning. 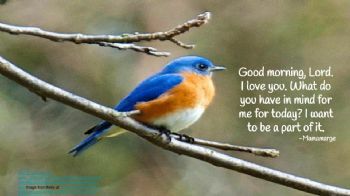 "Good Morning, Lord. I love you. What do you have in mind for me for today? I want to be a part of it." --Mamamarge. Great reminder to set the day! I am going to use (ask) that of Him tomorrow morning! Thank you for sharing. Good way to start the day. What an inspiring thing!!! I truly appreciate it.